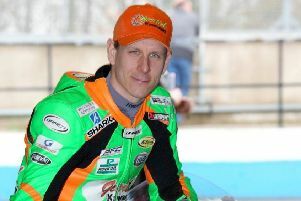 Kirton rider Aaron Clarke paid his second visit of the current campaign to Oulton Park in Cheshire where he finished 24th in round 10 of the National Superstock 600 championship. Free practice and first qualifying went well for Clarke, whose lap times were nearly a second better than on his last visit in May. But on Saturday overnight rain dampened the track and Clarke and the majority of riders decided to pull in, knowing their times would not match those of the first session. Clarke was on the eighth row of the grid for the start of Sunday’s 12 lap affair but he got a bad start and was bundled back to 27th on the first lap. He became embroiled in a battle for position with a large group of riders, with positions frequently exchanged throughout the 12 laps. While some riders fell in the frantic action Clarke held his ground and completed his race in 24th place. Clarke will be back on track in the penultimate round of the championship at Silverstone over the weekend of October 3-5.